NO DELIVERY BAG NO FOOD! Menulog delivers for Plato's Greek Chargrill so you'll be able to track your courier on a map. 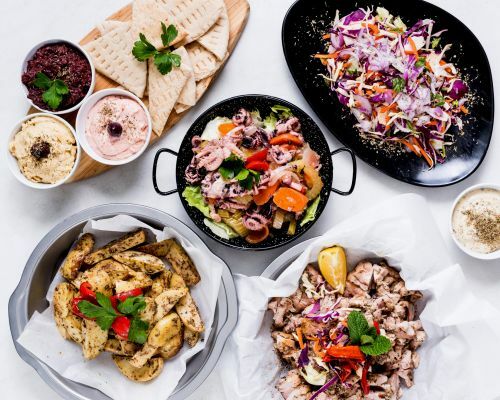 Three dips with chargrilled pita bread, one chicken yiros meat box, one Greek slaw salad and a pickled baby octopus salad. Lamb, tomato, lettuce, onion and tzatziki. Chicken, tomato, lettuce and onion lemon mayo. Lamb, chicken, tomato, lettuce, onion and tzatziki. Falafel, Greek slaw and hummus. Salt and pepper calamari, Greek slaw and lemon mayo. Haloumi, charred capsicum, eggplant, chips and olive tapenade. Grilled Greek sausage, cucumber, tomato, Spanish onion salsa and tzatziki. Octopus, Greek slaw and lemon mayo. Crumbed whiting, fresh parsley and chips and lemon mayo. Roasted capsicum, eggplant, tomato, cucumber, onion, feta cheese and melitzana dip. Choice of chicken, lamb or combo over chips. You must select your sauces. Choice of chicken, lamb or combo. Served with Greek slaw, chips and tzatziki. Choice of chicken, lamb or combo. Served with Greek slaw or pilaf rice or chips and tzatziki. Two dolomathes, two dips, feta, haloumi Kalamata olives, pickled baby octopus, Greek slaw and pita bread. Marinated baby octopus on a bed of Greek slaw. Six pieces. Vine leaves filled with rice and herbs, with melitzana dip and pita bread. Spinach, feta and herbs baked in filo. Smoked cod roe, lemon and olive oil. Roasted eggplant, capsicum and garlic. Potato, olive oil and garlic. Selection of three dips with pita. Choice of two proteins with Greek salad, chips, pita and tzatziki. Chicken yiros, lamb yiros, choice of two souvlakia, two loukanika, chips, tzatziki and pita bread. Fried haloumi fingers, drizzled with tzatziki, sweet chilli, peppered fig glaze, cranberries, fresh mint leaves and chilli flakes. Grilled haloumi cheese with peppered fig glaze. Lightly floured and fried, chips, Greek salad and tzatziki. Baked layered eggplant, potato, beef ragu, topped with bechamel and rich tomato salsa with Greek salad. Greek style roast potatoes, lemon pepper, garlic and oregano. Lamb's shoulder slow cooked, with Greek lemonates potatoes, toasted pita bread, Greek salad and tzatziki. Served with chips, Greek slaw and our own lemon mayo. Chips, feta crumble and oregano. Greek style sauteed seasoned rice. Chargrilled pita bread either plain or folded with your choice of dip. Red and white cabbage, carrot, Spanish onion, olive oil and red wine vinegar dressing. Lettuce, tomato, cucumber, Spanish onion, Kalamata olives and feta. Haloumi with greens, cranberries, feta, with olive oil and red wine vinegar dressing. Quinoa, lentils, cucumber, warm chicken, feta, leafy greens, walnuts and red wine vinegar dressing. Crushed almonds and walnuts, dusted with cinnamon and cloves in filo, soaked in sugar syrup. Shredded pastry base layered with vanilla custard, cream, topped with crushed almonds and walnuts. Roasted walnut and almond, wrapped with shredded pastry soaked in clove and cinnamon scented sugar syrup. Baked semolina custard slice encased with filo pastry, steeped in a citrus sugar syrup. Turkish delight, toasted walnuts and almonds wrapped in shredded and filo pastry basted with sugar syrup. Select 3 of your favourite Greek desserts. Haloumi cheese, charred capsicum, eggplant, chips and olive tapenade. Choice of three dips with pita bread. All our dips are home made with no preservatives or food colourings or additives. Roasted capsicum, eggplant, tomato, cucumber, onion, feta cheese and melitzana dip. Remove cheese for vegan option.